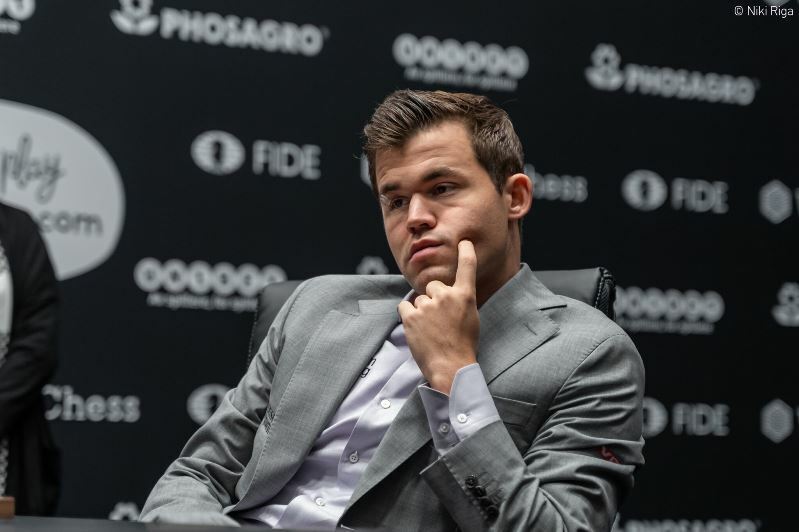 Magnus Carlsen said it was a case of “too complicated and too much at stake” after a fantastic double-edged struggle in Game 10 of the World Chess Championship match in London also ended in a draw. 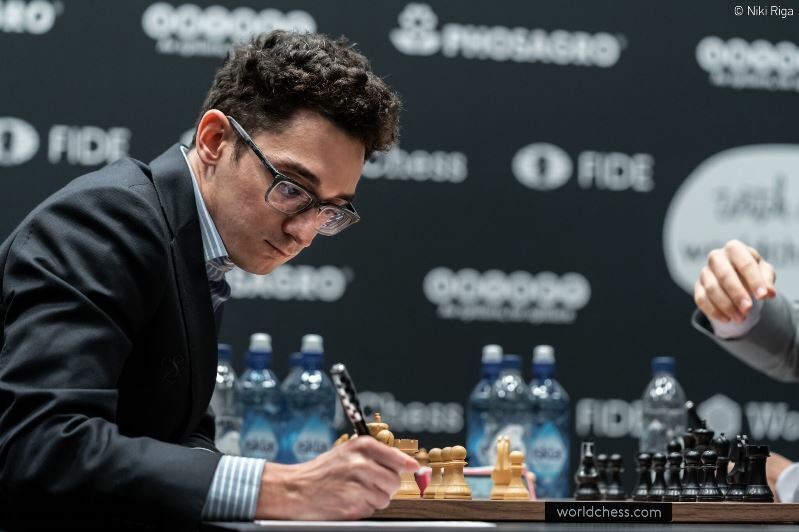 Fabiano Caruana sprung an early surprise in the Sveshnikov and gained an edge on the clock, but as Magnus found himself going all-in for a mating attack it seemed anything could happen. The position defied human analysis, but somehow still simplified into a draw, even if Magnus wobbled at the very end. There are now just two classical games remaining before tiebreaks. 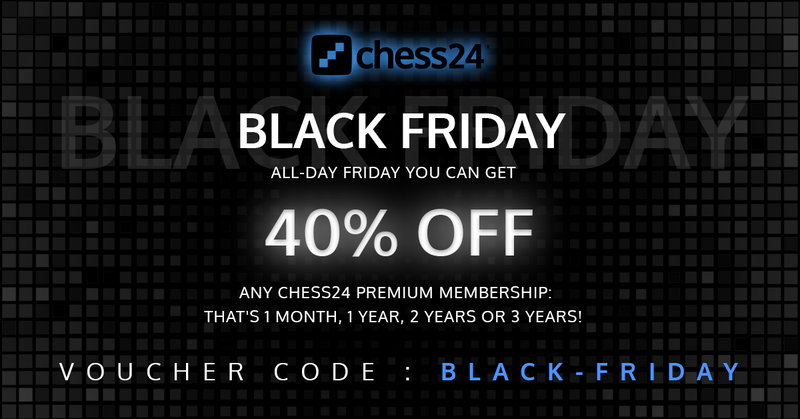 Today is Black Friday, and just a quick reminder that if you Go Premium with the voucher code BLACK-FRIDAY you’ll get our biggest ever discount of 40% - e.g. 1 month for just $5.99, or save up to $95 if you go for 3-year Premium! If you do that before 16:00 CET you’ll also be in with a chance of playing Peter Svidler in his 90-minute rest day Banter Blitz session. The first three were the Rossolimo variation with 3.Bb5, while in Game 8 and now Game 10 Fabiano has switched to 3.d4, with the Sveshnikov appearing on the board. Magnus must have had something prepared against the 12.Bd2 that Fabi played in the earlier game, but he didn’t get to show it since the challenger was ready with the outright novelty 12.b4!? By this stage, though, Fabiano was also on his own, and after a 17-minute think he went for the bold 19.Ra3! 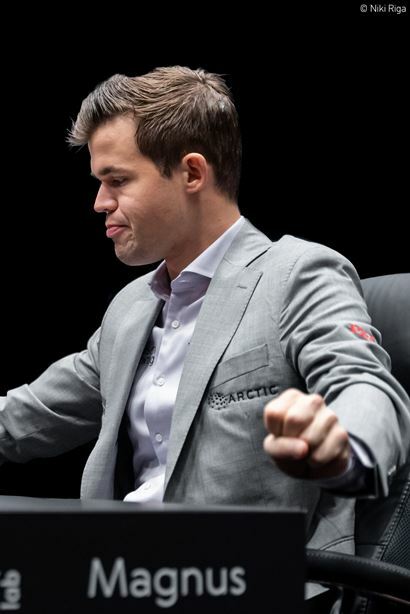 ?, threatening to swing his rook all the way to h3. As you can see from the screenshot above, it wasn't the computer's choice, but it upped the pressure on the World Champion, who later commented, “First of all I was pretty happy after the opening, and then I kind of missed this concept with Ra3”. Magnus spent 12 minutes over 19…Qg6, and every move had become critical. I thought for so long and I wasn’t sure about it, but I thought I’d just go for it and up the stakes even more. Either you win the game or you get mated. Even if Fabi suspects this attack is incorrect he still has to refute it over the board. The computer evaluations are good for guidance, but they aren't really practically relevant. It's this old chestnut of everything being 50:50 - either Black gives mate or he doesn't! I really didn’t want to take on b5. It feels kind of greedy, and I thought Rf6. I just didn’t really see how to defend against this attack. It’s the type of game I expected from this line. It’s very, very double-edged. Both sides are taking risks. Black takes some very clear risks, because he’s going for an attack, so he’s sort of going all-in, and of course I’m getting attacked, so I could potentially get mated, but at some point I really did feel like I would have an advantage. When I played 24.g3 – this was such a difficult moment, because after 23…Qg5 I had so many options. There’s a lot of potential for attack, but it’s still a bit slow, and I have to decide how to set up my pieces. I think 24.f3 was probably the best way to do it. After I played 24.g3 I started to wish I’d played f3. Remarkably quickly, though, the dark clouds around the white king began to lift and a drawn outcome to the game began to look entirely plausible. Perhaps the best way to grasp the raw emotion and confusion at this stage is from Grischuk’s exasperation in the live commentary! 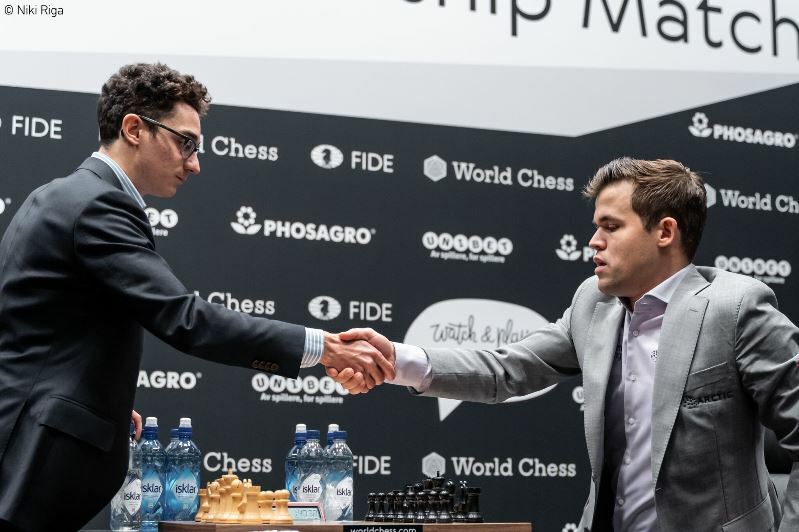 He would go on to call a later move by Magnus (30…Bd8), “the worst move of the match,” and say it was, “the first game in which the level of play is horrible”. On the other hand, he’d previously described the game as “real chess”, and later suspected he’d gone a bit too far! I think it was just a case of too complicated and too much at stake, I think that was the main thing here. I think I could have played better at many times. I think both of us made many mistakes. There was a little time pressure, for sure. I cannot say that I kept my cool one bit! It seems as though White has everything under control and can play 36.Qb3+?? Kh8 37.c4, but that loses on the spot to 37…Rxb6!! You could spot that, breathe a sigh of relief, and switch to 36.Qd4? ?, only to run into 36...e3!, as pointed out by Magnus, and again Black wins. If one of those "blunders" had happened in the game a tweet from Thanksgiving two years ago might have come back to haunt Fabi! There were so many moments for both of us to deviate along the way. The only stupid moment was I’d missed… or I didn’t miss Qe2, but I just didn’t think this move was possible. Fabiano could have wrapped up a draw comfortably with 40.Ra7!, but instead with just over 30 seconds remaining he went for the natural 40.Kh2!?. That left our commentary team worrying for Black’s survival after 40…Ke6, when the black king looks set to dominate the white one. Whether he’d seen it in advance or not, however, 41.g4! was just enough to keep a draw. The fact that the game became prolonged ultimately worked in Fabiano’s favour, since Magnus got a little too ambitious with 44…Kd4?! …and the game ended on move 54. Fabiano would have been within his rights to play on for another hour or two with his extra pawn, but there had already been enough torture for both players! Not after this one, that’s for sure! A better idea is probably to prolong the match, and then there will be less at stake in each game and slightly more room for experiments. He suggested 16 or 18 games, but this time round the match is 12 classical games, and that means there are just two remaining. Things are getting emotional... Now it's really time to start following. Something interesting will unavoidably happen! Either the match will be decided in Monday’s Game 12, or it’ll all come down to tiebreaks on Wednesday! Grischuk, when asked who will be the favourite for that, responded, "You can beat Magnus - that's perfectly possible - but you can never be a favourite against him!" First though, we have a rest day, and as usual that means that Peter Svidler will be hard at work playing Banter Blitz – catch his show from 16:00 CET!